Owen Mulligan came to Tyrone's rescue as his late point spoiled Louth's chances of a Bank of Ireland All-Ireland senior football championship round one qualifyier win in Navan as the sides finished 2-16 each after a thrilling match that still wasn't decided after extra time. Mulligan, who scored 2-06 (3f) in all, clipped over a free in extra-time to set up a second date with the Wee men. Two Mulligan goals helped Tyrone lead by 2-07 to 0-06 at the interval. However Louth were never too far behind and goals from Mark Stanfield (48 minutes) and JP Rooney (stoppage time) ensured extra time. Tyrone were stretched at the finish as both Stephen O'Neill and Ger Cavlan were forced off with injuries. A tight opening half saw full-forward O'Neill bag three of the Red Hands' first four points. Louth's Darren Clarke was also on target - three times in the opening 22 minutes. 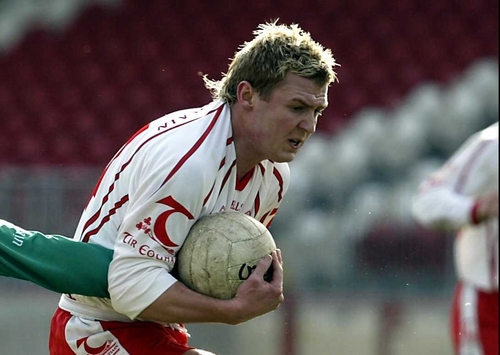 In the space of ten minutes before the break, 2005 All-Star Mulligan rippled the Louth net twice, adding two further points, to help his side go seven in front for the start of the second half. Mulligan's second goal came after an initial shot from O'Neill had bounced back off the post. A Stanfield point stopped the rot for Louth just before the half-time whistle. A fiery beginning to the second half saw the gap pared back to two points before Rooney set up Stanfield for Louth's first goal. Tyrone bridged the gap back to four by the 70-minute mark thansk mainly to two inspiring overs from substitute Enda McGinley. But Louth were far from finished and a Clarke point and Rooney's scrambled goal sent the game into extra-time. The 5,000 spectators were enthralled - points from Brian White and Mark Brennan even pushed Louth two points clear for the first time. 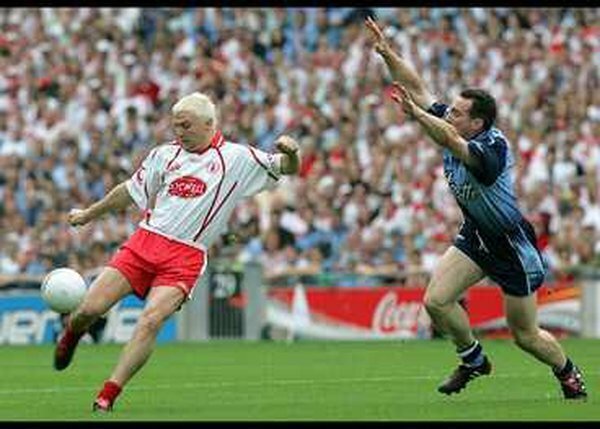 Were Tyrone about to relinquish the Sam Maguire Cup a full three months before the final? It would have been the case had Stanfield's driven shot arrowed in and not just wide of Pascal McConnell's goal in the first half of extra-time. Tyrone wrestled back possession and two Mulligan points saw them live to fight another day - although both Brian Meenan and Dermot Carlin missed chances to win this first game outright. The replay will take place next Saturday at Healy Park in Omagh (throw-in 3.30pm). Tyrone: P McConnell; R McMenamin, C McGinley, M McGee; D Harte, C Gormley, P Jordan (0-01); C Holmes, P Donnelly; S Cavanagh, G Cavlan (0-01 (1f)), R Mellon; M Penrose, S O'Neill (0-04 (1f, 1 '45')), O Mulligan (2-06 (3f)). Subs used: E McGinley (0-02) for Donnelly, R Mulgrew (0-02) for Cavlan, D Carlin for Harte, B Meenan for Holmes, A Ball for O'Neill, B Donnelly for Mellon, C Gourley for McGee. Louth: S Reynolds; D Brennan, C Goss, J Carr (0-01); J O'Brien, P McGinnity, J Neary; M Farrelly (0-01), P Keenan (0-01); C Grimes, M Brennan (0-01), M Stanfield (1-02); JP Rooney (1-00), R Carroll, D Clarke (0-07 (4f)). Subs used: R Finnegan (0-01) for Carroll, B White (0-02) for Grimes, Grimes for Rooney, T O'Brien for Clarke, M Fanning for O'Brien.